Our family has been trying to eat healthier foods. 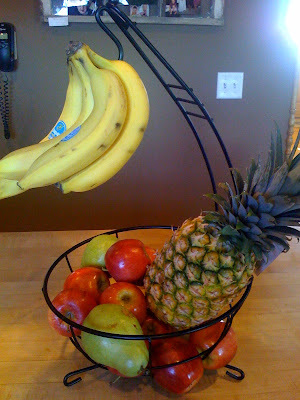 To encourage us to do this, I purchased a wonderful fruit holder. I place it on my island and we always see it, so we are prone to pick a piece of fruit rather than chips, etc…for a snack. I purchased the holder at Bed, Bath and Beyond for $14.99 and used my $5 off coupon (even though it was expired…they still take them). Grab a piece of fruit today!